Thursday December 26 1907 When I got up this morning decided to go home will Mrs Brown I hurried through some of the work. Got [illegible] Hoffman to stay while I was away and Will took me down in time for the eleven oclock train We had a nice day together going over. Ott had telephoned Mr Br that we were coming and Jim met me at the station. We were soon over to the house where a warm welcome and a good supper awaited us. We talked till bedtime. 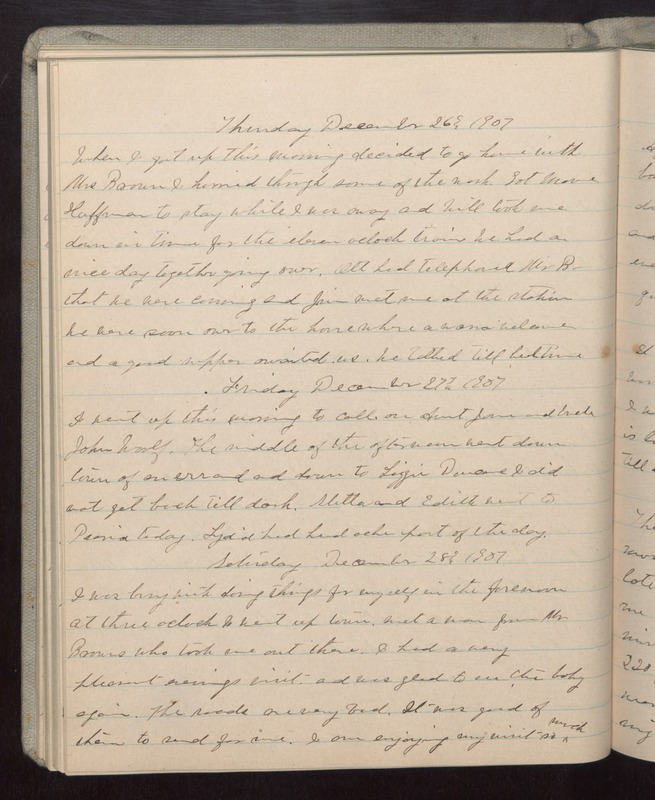 Friday December 27 1907 I went up this morning to call on Aunt Jane and [illegible] John Woolf. The middle of the afternoon went down town of an errand and down to Lizzy Duncans I did not get back till dark. [illegible] and Edith went to Peoria today. Lydia had head ache part of the day. Saturday December 28 1907 I was busy with doing things for myself in the forenoon at three oclock I went up town. met a man from Mr Browns who took me out there. I had a very pleasant evenings visit, and was glad to see the baby again. The roads are very bad. It was good of them to send for me. I am enjoying my visit so much.